On 26 November 2015, several media outlets were contacted in Victoria including the ProjectTV. What was explained were concerns that a new bill being sold in Australia as an ICE bill was about to introduce new laws against medical cannabis users. No media outlets chose to fact check the story verified by the LIV (Law Institute Victoria) and other MPs as correct. The author of the bill Wade Noonan MP stepped down on 8 Feb 2016 and the bill was passed with little debate on 9 Feb 2016 by 33-6. Since that passing there have been various state and federal activities all without transparency or clarity. In an astounding case of WTF? The unsuspecting public and ministers have saluted their new bill. It gives praise to the great response of many that used “illegal’ cannabis including flower, tinctures, oils etc, they have now legalised it. Minus the Cannabis flower, tinctures, and oils. 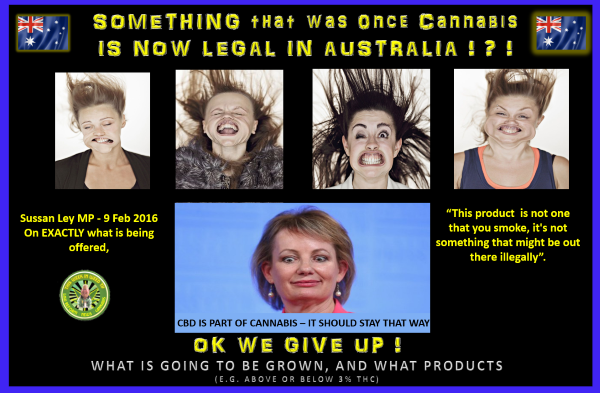 It goes something like this, Many forget the pharmaceutical industry and lobby is deeply embedded in the Australia Government http://bit.ly/pharma-gov and have had 20 years since Medical Cannabis was legalised in California to prepare for this. Recently when an MP was asked if he was for or against medical cannabis is said unashamedly, it depends if Novartis says it is or not. Novartis are the 2nd largest Pharmaceutical Company in the world worth around $107Billion AUD. Novartis is the sole distributor of products by GW UK in Australia (fulfilled by Bayer in the USA). GW UK in 2011 on discovering that some of the over 100 cannabinoids and 400 enzymes in Cannabis did some pretty good things, went on dissecting the elements and patented them and their extraction process into medicine for trial. Sativex was the first one that has fialed in some trials. It uses an unnatural mix of THC and CBD. 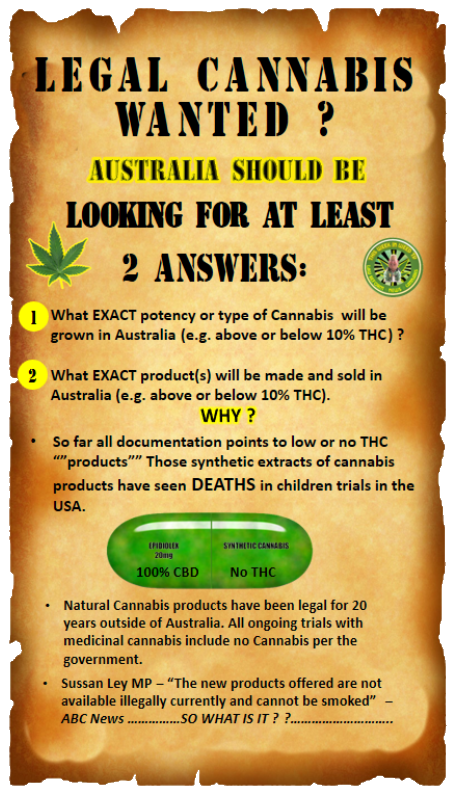 Epidiloex the latest drug being tested in Australia has no THC and has seen deaths during trials in the USA. Posted on February 26, 2016 by Tech-News-TVTagged cannabis, epidiloex, medical cannabis, novartis, the project, the project tv.